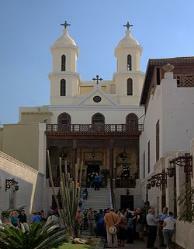 describes the distinctive art and architecture that developed as an early expression of the new faith. prophet, in Chapter 19, Verse 19 says "In that day there will be an altar to the LORD in the midst of the land of Egypt, and a pillar to the LORD at its border." 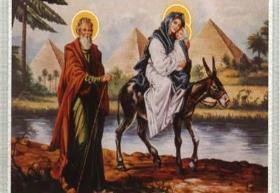 after all, Egypt was the refuge that the Holy Family sought in its flight from Judea. libraries, museums and universities throughout the world possess hundreds and thousands of Coptic manuscripts. with campuses in Alexandria, Cairo, New Jersey, and Los Angeles. 400 A.D. and left details of his experiences in his letters. believe in two natures "human" and "divine" that are united in one "without mingling, without confusion, and without alteration. Egypt by farmers to keep track of the various agricultural seasons and in the Coptic Church Lectionary. Egyptian society united against the religious intolerance of extremist groups, who occasionally subject the Copts to persecution and terror. the Sixth United Nations Secretary-General (1992-1997). Another is Dr. Magdy Yacoub one of the world's most famous heart surgeons. Matrimony cannot be performed during a fasting season. Mark used (in Greek) in the first century. of Christ (Easter) as much as His Advent (Christmas), if not more. Easter is usually on the second Sunday after the first full moon in Spring. of the Coptic Church include, the Advent (Fast of the Nativity), the Fast of the Apostles, the Fast of the Virgin Saint Mary, and the Fast of Nineveh. married and must attend the Catechetical School before being ordained. stage in 1883 A.D. to act as a liaison between the Church and the Government. The second is a joint lay-clerical committee, which appeared on the stage in 1928 A.
D. to oversee and monitor the management of the Coptic Church's endowments in accordance with the Egyptian laws. its government, and above all its people. They pray for the world's peace and for the well-being of the human race.